I love Italian specialty food shops and try to seek them out wherever I go. To me they provide a feeling of extreme comfort. I’m sure it stems from growing up in an area where these sort of stores were plentiful and shopping at them was a regular occurrence. Di Palo’s Fine Foods, a 4th generation shop located in NY City’s Little Italy, has been on my “must visit” list for some time now. They are reported to have a wonderful selection of meats, cheeses, and various other authentic Italian specialties. It's noted that Lou Di Palo travels to Italy several times a year to hand pick the perfect products for his customers. In my book... it doesn’t get much better than that. So you can probably imagine how excited I was when they contacted me to do a review. What a great opportunity to be able to experience a small taste of what Di Palo’s has to offer in the comfort of my home. I was sent a block of Grana Padano, a semi-aged hard Italian cheese that is one of the most popular cheeses in Italy. A cow’s milk cheese very similar to Parmigiano Reggiano, Grana Padano is milder and much less complex in flavor. Also included for me to sample were two different varieties of mostarda; pear and mixed berry. Made by slow cooking fruit with mustard oil these condiments have a sweet, slightly spicy flavor; which paired well with the cheese. If you’ve never had a mostarda I would strongly recommend adding one to your next meat and cheese plate. Trust me you won’t be disappointed. If you’ve been to Di Palo’s I would love to hear your thoughts on the store and/or its products. Never had mostarda - sounds like something I need to try! My grandfather used to live in the building on the lower east side with the original owners. What a lovely set of foods to review! My husband adores cheese, and I'm about to go purchase some special blocks for Christmas. I am going to hope I can find some mostarda too. It sounds delicious! Thank you so much for sharing with me today. I hope you have a joyful weekend! 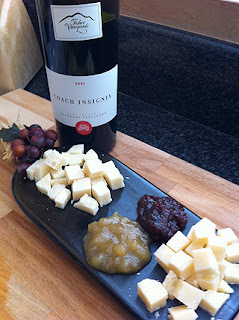 Di Palo's is a great store and mostarda does go so well with cheeses. I wonder how the arrival of Eataly is going to affect Di Palo's.